Caru has no artificial colors, flavors, or preservatives. No grains, gluten, or added thickeners beyond tapioca. Real meat and veggies in every carton. Turkey and salmon provide flavor your dog will love. The limited ingredient formula is perfect for dogs that have skin or stomach sensitivities. Cooked at a low temperature so nutrients are retained better than the high temperature cooked canned foods on the market. This is a very important feature of this food. High-temperature cooking is used in brands that are not always using the best ingredients! Salmon in every bite makes this a food to consider for dogs that seem to do better with some fish oil or fish protein in their diet. This would be great as a topping for Lab dog food. You could just cook your own dog food for the same cost or less. This food is not typically found in grocery stores and may be harder to find at pet stores. This means you need to order a supply and keep it on auto order. As with any food you need to gradually switch your dog over. Dogs with very sensitive stomachs may need longer but you may be surprised how easy it is to switch to Caru’s high-quality formula. To switch just replace your dog’s food with Caru gradually over a 5-14 day time period. If using as a topping there is no need to follow these guidelines although you may want to start slowely if you have a pooch that gobbles down treats fast. When fed alone, use 1 pack daily for every 12 lbs of body weight. If feeding with typical dry dog food, reduce dry food by 2/3 cup for every 1 pack of Daily Dish. Serve as a complete and balanced meal or as a topper with dry food. Adjust the amount of food fed to meet your dog’s individual needs. Caru is a complete dog food so you can feed it alone if desired. Adjust the amount of food fed to meet your dog’s individual needs based on activity level and age. Always make sure water is fresh and clean. Caru can be slightly heated as a treat if your dog likes a warmer meal in the cold months. Just be careful to not heat it too much. Caru is a high-quality wet dog food suitable for all adult dogs. While it may be a delicious topping for puppies, you should feed a good dry puppy food while they are growing. The price point makes it not suitable for those with a lot of dogs or that have giant breeds. 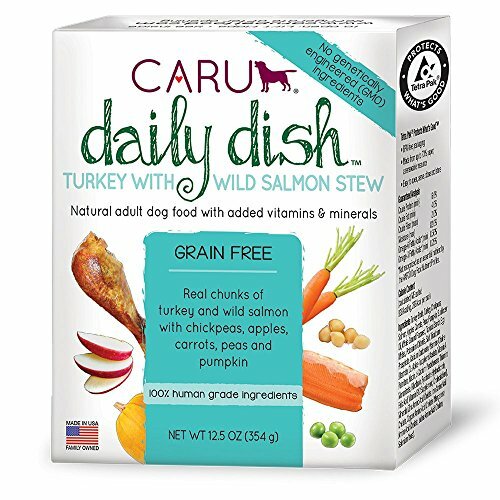 Caru is a good option for those that have small or toy breed dogs that they would like to cook for but don’t have the time to cook a balanced ration for their canine companion.